When Lone Scherfig made the sleeper hit An Education, the coming-of-age romance that launched Carey Mulligan to stardom, she was already well into her impressive career. A graduate of the National Film School of Denmark, and won festival praise for her films The Birthday Party and On Our Own. But it was Italian for Beginners, the ultra-charming romantic comedy that won Scherfig top honors at Berlin. She parlayed that success into the off-beat comedies Wilbur Wants to Kill Himself and Just Like Home. 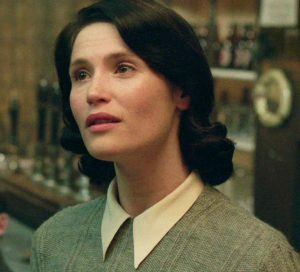 But it was An Education (nominated for Best Picture) which moved her to a whole new level in the industry, allowing her take make riskier choices such as the time-shifting drama One Day and the provocative Riot Club, a furious look at white, male privilege in England’s upper-class. 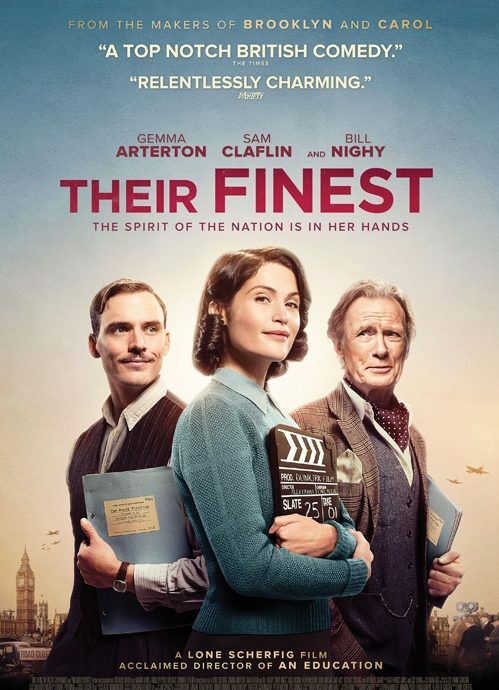 The World War II, London-set Their Finest, is her latest and definite return to the world of charming films in the most heartfelt and welcome sense of the word. A celebration of movies and the people that made them, the film stars an impressive ensemble of familiar British stars including Gemma Arterton, Sam Claflin, Bill Nighy, Jack Huston, Richard E. Grant, Helen McCrory, Eddie Marsan, and American Jake Lacy (as the American, of course). We spoke about working with her leads, bringing this period of history to life, and the unexpected next movies she wants to make in her career. Lesley Coffin: There are moments in the film where the two main characters discuss the exact moments in the film which will make audiences laugh or cry. As a filmmaker do you think about that about that from such an analytical perspective? Lone Scherfig: No, I’m just happy if people react, and I can often use myself as a barometer. While shooting, I try to delete all the information I have about what went into filming the scene, and think about if it will work on the screen. But sometimes, I’m surprised when something works, and I’ve been surprised by what scenes work. But then I have to shoot the same scene over and over. But it’s really in the editing, because that’s when you’re constructing a film, and start thinking about the moments someone will cry or laugh, because that depends so much on timing. But I’m not as calculating as some of the characters. I’m still surprised by how moved I was when I saw the film with an audience. The film is quite complex and there are a lot of technical things going on, which I hope people won’t notice. But the most emotional shots are just close-ups of Gemma. Lesley Coffin: And she’s so great, she’s really conveys a lot in those close-ups and quiet moments. She’s so revealing while also being very subtle. Lesley Coffin: Did you talk about any actresses from the time period that she could emulate? Lone Scherfig: She watched a number of films from the time, primarily because the dialogue in this film had to be so specific. There is a screwball element, but she also has a slightly clipped accent because the character is Welsh. Lesley Coffin: How did Catrin’s Welsh background inform the character? Lone Scherfig: She’s the small town girl coming to the big city, and insists on staying, even if London is bombed every single night. It’s the story of a woman who left home to come to London with the man who was painting the steel workers in her hometown. And that is where she finds a talent she never knew she had, and wouldn’t have known if she hadn’t come to London. Lesley Coffin: We see gradual changes in both Bill and Sam’s characters when it comes to allowing a woman into their professional space. What did you want to say about how men adapt to these changes? Lone Scherfig: Sam’s character, Buckley, says something early on in the film about men who’ve been to war either don’t come back at all or come back broken. Some men will become heroes, others stupid bullies. And he acknowledges that he’s not in touch with his own feelings. Their journey is for her to find her professional feet, while he finds his emotional feet. Or maybe not feet, maybe just an emotional life. He’s the most sexist, but he also likes working with her and respects her work. And listens to her ideas, which is the same thing that happens to Bill’s character. At first he can’t stand being told what to do by a woman. He can’t imagine that she would have written the script. But during the filming he becomes more and more dependent on her, and looks to her for guidance. He only wants to say her lines. These are two men who change, truly change their opinions on women, because they meet her. Lesley Coffin: This film couldn’t be a bigger flip from Riot Club’s very cynical view of toxic masculinity, which also starred Sam in a very different role. What made you think of casting him again? Lone Scherfig: Buckley is 20 years older than the character he played in Riot Club, and he’s just a brilliant actor who can play completely different roles. And in real life, Sam nothing like Alistair or Buckley. Lesley Coffin: What drew you to this project initially? Lone Scherfig: I love that the world it represents was this time when movies really matter dearly to people. It was a time when the movies were so important. And I loved the character of Ambrose. The two producers, Steven Woolley and Amanda Posey, found the book but I was unavailable when they first tried to get it off the ground. But then things changed and I was available and started planning with the writer Gaby Chiappe. Steven was so inspirational because he knows those films so well. He’s probably the best producer I’ve worked with. Lesley Coffin: When you did the research on the history of London and England at that time, and the films which came from that period, what surprised you? Lone Scherfig: I didn’t know very much because growing up I was in Denmark, which had been occupied. It was the same war, but a very different one as well. The childhood memories of my parents in Denmark, they were a generation that wanted to forget the war and push it out of the memories. You see the modern Danish furniture coming out right after the war because they wanted this new, bright, clean world. And they don’t talk much about it. But in England, it was their finest hour. There’s more pride and you see it all over London. There are places in London where it feels like the war ended 10 minutes ago. But I did know quite a lot about the film industry at that time, I even wrote about it when I went to University in the late ‘70s. And the art department, costume department, set designers, Gaby knew a lot I didn’t know, so I just listened to them and tried to learn. Lesley Coffin: Pinewood Studios is its own piece of British history, and is a landmark in world cinema. What was it like filming at a studio that made movies during the period you’re representing? Lone Scherfig: The film studio in the film is Pinewood, and I just love working there. They make really big, spectacular films. And they make smaller films there. I’ve done my sound work at Pinewood many times. I remember being so proud when I got my own parking space. I still have the sign. Being there, you feel like a proper filmmaker, and you’re around all these other filmmakers so you take yourself more seriously. I love working there. But I’m very excited because the next film I’ll make is here in New York. Lesley Coffin: The film talks a lot about the role movies play in the lives of the audience, and the responsibilities the filmmakers have to bring something of quality to an audience. Have you thought about how you select the projects you want to work on and how to navigate your career? Lone Scherfig: I think filmmakers do have an obligation to select films that put out something they believe in and reflect their values or beliefs. And I do turn down films, films I find too generic or too similar to what I’ve already done or don’t have meaning to me. You only have so much time and directing a film takes so long you need to really love the material. The truth is, most of the films I’ve made are labeled romantic comedies, but that’s not one of my favorite genres. I think it can be the most formulaic, with the strictest rules. I think you see more visionary films in some of the bigger films. I think the Marvel films are much more visionary than most of the nice romantic comedies I watch on a plane. Lesley Coffin: Would you be interested in directing a Marvel movie if they came knocking? Lone Scherfig: Yes, I really would. I just have two films I want to make first. But yes, of course, I think it would be super challenging, which I’d enjoy.